Markets are always moving. ICE mobile gives you the security and technology to confidently manage risk in real time on the go. 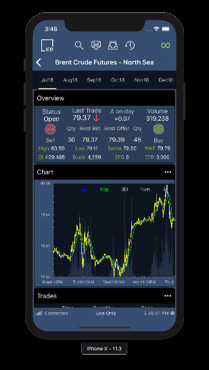 ICE trading application functionality is delivered directly to your mobile device, with real-time analytics, and instant messaging to ensure you’re never disconnected from the markets. Download ICE mobile and use your ICE credentials to log in. For secure access to full trading capability or to view/cancel trading orders and fills, email icehelpdesk@theice.com to activate your account.